Hurtling downriver with a man overboard. 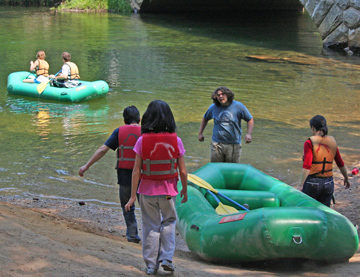 Once the water and weather warm up in June, rafting season officially begins along the Merced River. This pastime is definitely for the faint of heart. 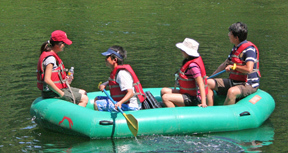 You may not find Level Six rapids along the peaceful current that runs though the hub of Yosemite Valley, but that doesn't stop the rafting center from depleting its entire inventory by one o'clock on a beautiful summer day. Visitors start flocking into Curry Village to sign up as early as 10 a.m., collect their rubber conveyances and immediately head down to the shore like Navy Seals on a mission. 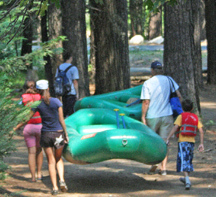 Hauling the raft is the most difficult part of the assignment, as the inflatables are much heavier than they look. Fortunately, the short trip to the water is all downhill. You'll pass a restroom then follow a trail about 15 yards to Southside Drive. Shuttle bus drivers are known to delay moving through the intersection when they see a group like the one in the right photo above walk up to the stop sign. 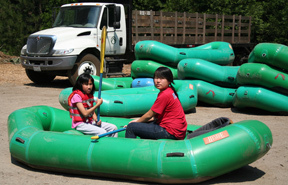 If you're lucky, they'll wave you across so you won't have to set the raft down, then lift it again. After you cross, the shore is just a few yards away. Once you're underway on the river, you're on your own. 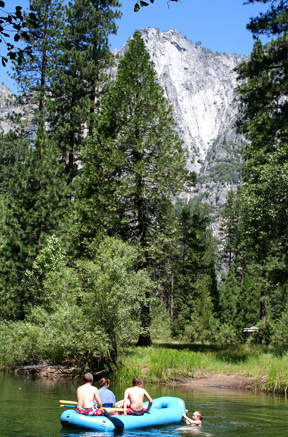 At least, until you arrive at the pick-up point near the 4-mile trailhead, which is about two miles downstream. Along the route, you'll find sandy beaches to stop at and play. And although you can't tell from the pictures, it can get real hot on the river, even though the water itself is icy cold. So bring a hat, sunscreen and a backpack or other storage container for food/water. A swim suit for a quick dip is also appropo. Of course, if there are problems along the way, you can commiserate about them later at the bar. Curry Village is buzzing in the afternoon and evenings. This little nook at tope left is located on the pizza deck. That's Half Dome at the top, by the way, a little washed out by the camera lens. 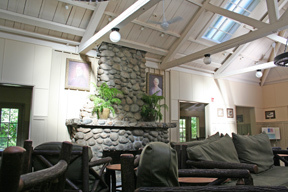 And if you don't drink, you can take your worries or your laptop in the renovated lounge. This building is just a stone's throw from the deck. In really hot weather, it gets toasty in here but most of the time it's not too bad. If nothing else, you write your Huck Finn memoirs. I don't think you can get a wireless signal. 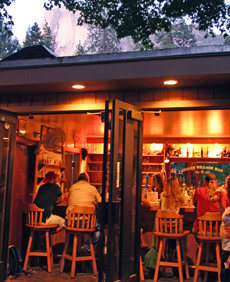 You have to go over to the Ahwahnee or Yosemite Lodge for that. Wake me when it's over. 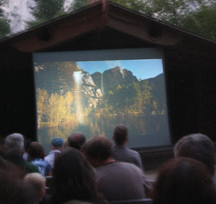 The film that's showing is "The National Parks: America's Best Idea". And while that may be true, the Ken Burns series is unfortunately not one of his better efforts. Finally, to finish up the day where you started it, stick around until 8 p.m. and watch a movie or slide show at the Curry amphitheatre, next door to the lounge. Decades ago, this is was where Mother Curry and her huband put on their nightly entertainment of music and skits. Then at 9 p.m. everyone turned and looked up to Glacier Point for the firefalls This treat was banned in the seventies but from to time they'll show a movie about recounting the whole evolution of the event and what it looked like pouring down the granite.